Following the success of last year’s meetup in Manchester, we decided to build up the tradition by holding another UK-based event, this time in London. We planned to assemble at 11:00 in a local Starbucks, but, in the true spirit of ambiguity, did not realize that there were actually five Starbucks locations on the same road. Not for nothing, however, are we experts in remote communication! Once the confusion was resolved, we congregated at Nandos for lunch and drinks. Most of our time was spent taking pictures of others taking pictures of Bertie (for the masterpieces themselves, see the event topic). No London meetup is complete without a trip to the London Eye, however due to long queues and spontaneous developments of acrophobia, we instead opted for a cruise down the Thames to Tower Bridge. With our earlier failure still nagging at our egos, we decided to reattempt an excursion to Starbucks, which I am happy to report was successful. So on it was to the evening venue, Bodeans. After being taken downstairs and presented with a massive two-course meal, courtesy of phpBB, a few of us even had space for pudding. Well fed, we took the opportunity to snap some group photos for the phpBB scrapbook. The night then ended for some, while pubs began for others. Top: Bertie, of course. 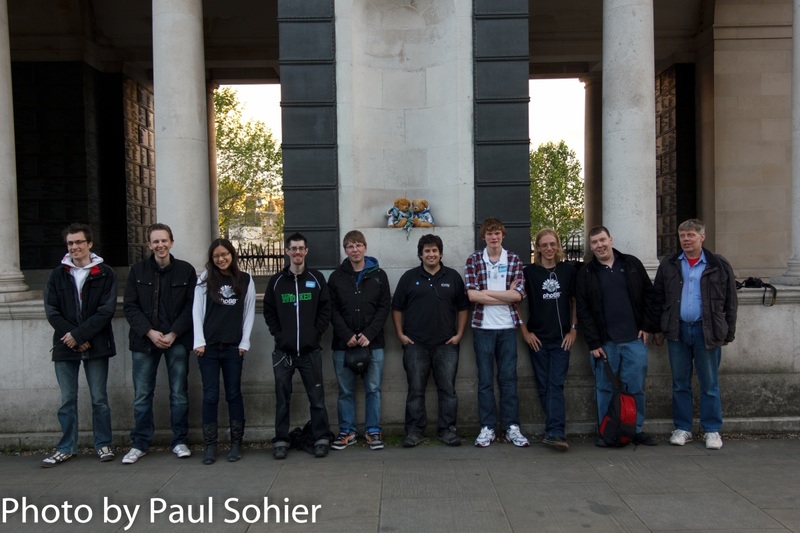 Left to Right: Raimon (Styles Team Leader), Derky (MOD Team), dellsystem (Website & Moderator Team), stickerboy (Ex-Styles & Moderator Team), nickvergessen (Development Team), ToonArmy (Development Team), Unknown Bliss (Website Team), Erik Frèrejean (Support Team), Paul (MOD Team) and Adrian (Community Member). Stickerboy’s girlfriend and noth (Community Member) also attended but do not appear in the above photo. You can view more pictures here, here and here.